Traditional red wooden house in village of Uvanå on northernmost shores of Lake Nain bordering Värmland and Dalarna. The main building was once the village store, which explains the name 'Gammal Affar'. All accommodation is extremely spacious. The main house comprises three large bedrooms and sleeps a family group of up to 6 quite comfortably. Downstairs, in the room which once housed a shop, there is a large living area which includes open plan lounge and dining space with seating for 8-10 people. We have had a wood burning stove recently installed which adds a welcome cosiness on cooler months. There is a TV and well-stocked DVD and VHS library. Also downstairs we have a large open bedroom with 3 beds. From the hall there is a downstairs bathroom with large shower, toilet and wash basin. Upstairs, once the store-keeper's apartment, there are two spacious bedrooms, one with a queen/double bed and one with twin beds, a quiet lounge with open fireplace and stunning views of the lake. Also upstairs we have a separate, fully equipped kitchen with breakfast area. Cottage 1 is an historical, 16th century log-built 'stuga' cabin with king size bed, open fireplace, lounge space, fully equipped kitchen dining area and toilet with handbasin. Cottage 2 contains bunk beds, shower area and also houses the sauna cabin. Beautiful lake views from both. All properties are heated and constant running hot water supplied by the geo-thermal system. In 2015 we have had a large decking area built in the main garden with dining table and seats and sun loungers for relaxation and outdoor dining. Views over the garden and lake. Things to do in Uvana village: The village of Uvanå is deep in the forests of Värmland at the northern head of Lake Nain which borders the Dalarna region of Sweden. The region is steeped in Swedish traditions and ancient folklore, and famous for its midsummer festivities and crafts such as the making of the Dala horse. The immediate area is referred to as 'Tiomilaskogen.' (Ten Mile Wood - that's Swedish miles!). Each year the villages of Tiomilaskogen, including Uvanå host folk arts festival at the end of July. You can sample regional foods, buy traditional craft items, and see the work of locally based artists and performers . You can also visit the neighbouring villages in the woods where everyone welcomes you and opens their doors. The lake is just a short walk away from the house approx 100 m.Here you can swim or launch one of our canoes. There is also a swimming area and beach 10 min walk from the house- signposted 'Badplats'. There is a local 'fishing club' in front of our property on the lake shores. Fishing permits (fiskekort) can be purchased from any of our neighbours for a small fee. This will allow you to fish from other local lakes. Explore by boat, hike or bike. Places of interest/things to do in summer: We have local guides in the area from whom you can also rent boats, bikes and winter equipment. The forest is full of walking and cycling tracks. You can pick wild blueberries and lingonberries from the surrounding forest (or in season help yourself to blackcurrants, raspberries and gooseberries from the garden). In Yttermalung hire a 'Bastu Flötten'/floating sauna on a motorised raft, take a cool dip, fish, picnic. Try quad biking, horse riding and white water canoeing or take a hot tub. The local wildlife of the area are moose, beaver, lynx, wolf and brown bear - but don't worry the last two stay away from people in the wild! A guide can take you on moose/elk or beaver safari. Visit the predator centre in Råda village or Orsa bear park.There is a moose sanctuary near Ekshärad. Karlstad is just over an hour away if you want to shop or visit lake Vänern. Visit Sunne the home of Selma Lagerlof,the famous writer. Visit Tourist Info in Hagfors or Eksharad for more ideas on activities and adventures. Take a steam boat on the fryken lakes from Sunne to Torsby. Things to do in winter: There is excellent season-long downhill skiing at Sälen(80km), Branäs(100km) or Säfsen(50km) and good local practice slopes at Ekshärad, Malung and Äpplebo. Floodlit night-skiing above the twinkling village lights of Ekshärad is a rare treat. Try cross country ski lessons or learn to snow shoe hike or ice fish in winter with our neighbour in Tyngsjö 6km away. If the conditions are good he also lays an ice-skating track around the lake there. Husky dogs in Sunnemo/Malung-take a husky sled through the snow or let them take you for a walk. Hej! We are Mike and Jackie Lucas. We currently live in Cambridge , UK. Mike is originally from Manchester and I grew up in Lincoln. We have 2 sons- Sam is 24 and Tom is 21! We love the outdoors and visiting new, unspoilt areas. Sweden is very unspoilt! Beautiful fresh air and wonderful scenery and wildlife. We love to be in and on water! which is why we choose our property. It is at the head of Lake Nain with many quiet and wonderful beaches to explore.If you like foraging in the woods, Sweden is great for picking wild blueberries, strawberries, raspberries, cloudberries and mushrooms. As well as catching fish in the lake! Its a wonderful area to explore. we are surrounded by many beautiful lakes. The house offers very spacious accommodation and the views from the upstairs lounge and the garden of the lake are what we love most. We have many garden chairs, sun-loungers, tables and cushions so that relaxing in the garden is a joy! We also have a gazebo so that we can enjoy dining out in the glorious light, summer evenings and now have a large, beautiful decking area. Newly installed shower cubicles in both main house and small stuga. Constant hot water supply to main house from geothermal heating system. Hot water supply by electric boilers in the stugas. The bathrooms are on the ground floor. Geo-thermal heating and hot water. All bed linen can be provided but guests must wash and dry these using washing machine and tumble dryer unless an additional cleaning fee has been agreed with the owners. Large parking area at the front and side of the main house. All towels can be provided but guests must wash and dry these using washing machine and tumble dryer unless an additional cleaning fee has been agreed with the owners. We have exercise/yoga mats, hand weights, second hand bikes and a selection of second hand snow equipment. Very spacious with small freezer section, wine rack and salad drawer. Exceptionally well equipped for all home comforts from coffee percolator, expresso maker, bread machine and home baking equipment! A very spacious dining area in the main lounge of the house. The large dining table seats 10 comfortably. There is a selection of fiction and non-fiction books for guest use and also some maps and guide books for touring the area. There is an extensive lawned garden with views of the lake. All bikes are second hand and may need some attention if previous guests have used them. Tyre repair kits and bike oil is provided. The house rental includes use of a rowing boat with small battery powered motor. In the garden we have a raised sun terrace for relaxing and dining. We do have some old wet suit equipment for bathing and life jackets available with the boat and canoes. The sauna is situated in the smaller house in the garden. The dining area in the main house has space to sit 10 people.there is enough cutlery and crockery for 10 people.The Large stuga has additional kitchen/dining area for up to 4 people. The Sauna cabin is located in the small stuga. Wood -fired hot tub on garden decking. Linen and towels for house use only are available on request. Please bring own beach towels. Washing machine and tumble drier are located in the basement of the main house. Outdoor equipment including canoes, bikes and range of garden games such as badminton, darts, skittles and croquet set are available for use during your stay. Kitchen is very well-equipped including basic food and supplies for your convenience but please replace what you use. Please Note: Final cleaning is done by guests themselves. Alternatively this can be arranged at a cost of £150. Very spacious accomadation right in the middle of beautiful Swedish forests and lakes. Excellent, spacious, clean with everything you need to enjoy your holiday. We are so pleased that you enjoyed your stay at our place in Uvanå. Winter is a magical time in Sweden with lots of snowy activities to enjoy. We hope that you enjoyed the cross country skiing, downhill skiing, husky dog sledding, ice fishing and snow shoe hiking. We would highly recommend Gammal Affar in Uvana for anyone looking for a taste of Sweden. It offers a traditionally Swedish summerhouse with everything that goes with it – open fires; guest stugor in the grounds; perfect lake at the end of the garden; boat and canoes; sauna; forest; flora and fauna … a perfect setting. The accommodation was spacious and comfortable for our three generations (7 of us), and beautifully decorated and furnished. It was clean and tidy when we arrived and Jackie was available at all times to answer any queries we had during our stay. The open fires made us cosy on the cooler evenings, the kitchen was well equipped and the dining room made every meal feel like a special occasion. The new hot tub was a lot of fun, (plenty of room for all of us) and the sun deck was great too. We have some amazing photos of the lake taken from the boat and bathing place, as a reminder of a truly memorable holiday. We wish we could have stayed longer to enjoy the good weather (our first few days were cold and wet)! By the way, we would recommend a visit to the Varmland Elk Park run by a young English guy, James. He and Jamie offer an interesting tour with lots of information and facts about Swedish Elk, as well as really hands-on contact with elks there. Thanks, Jackie, we hope to be back again in the future! Wonderful estate with 3 houses! Very friendly owners who leave you all possible equipment in a house with warm atmosphere. The property really has 3 houses, ideal for larger groups. The location is wonderful, very close to the lake, in rough nature, situated in a small community with about 10 other houses. Neighbors are helpful when needed. Wintertime gave us a peek into a true winter wonderland! Dear Annebeth and family, we are really pleased that you had a great time staying at our place in Uvanå! It is quite magical during the winter season and the houses provide a warm and cosy, welcome shelter from the cold weather activities! We hope that you will be able to visit again. You are welcome to return at any time! A very beautiful place te stay! 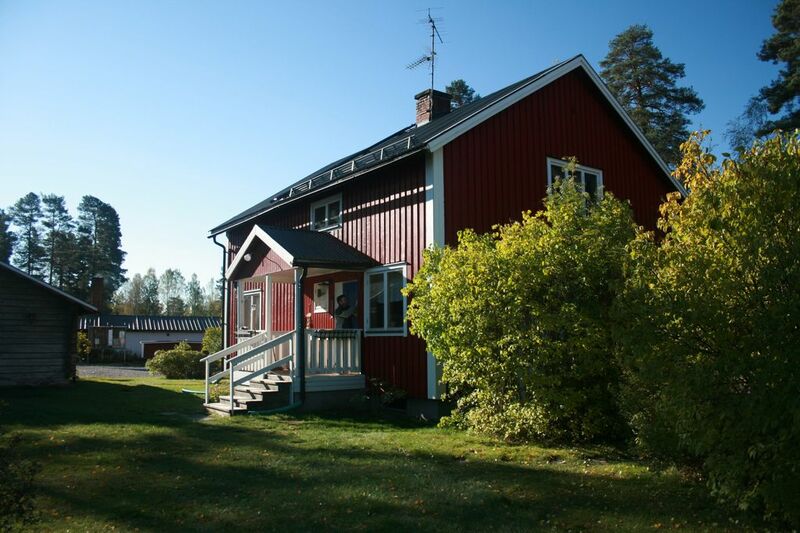 Very nice and quiet place to stay in a traditional Swedish house in the middle of the Woods. We loved the lake, the sauna, walks, picking Berry's and canoeing. We saw even some wildlife. We recommend this place to everyone. Like Canada - only nearer! We had a fantastic family holiday at Uvanå. The property description was accurate although as we were a group of four we spent most of our time in the upstairs bit. The property was very well equipped and we had a very comfortable stay. The peace and tranquility was amazing although, on the flip side, everywhere is at least half an hours drive away. We had great fun canoeing out to the beach on the lake, fishing, playing badminton, croquet, watching films, darts, trying a sauna and the big boys book of general knowledge quiz! We did some lovely walks in the woods and also trips out to Eksharad, Hagfors (the velo rail visit to the museum was very enjoyable) and went on an Elk Safari. I would recommend this property to anyone who is looking for a relaxing holiday in peaceful surroundings. The only downside was the midges, but as long as you took precautions this wasn't a particular problem. We are so glad that you had a fantastic family holiday and made use of all the facilities on offer at our property. It is definately a place to escape and relax and get back to nature! There are a lot of opportunities to explore by canoe, bike or on foot or just play games or read books in the garden! We find being away from the main towns one of the highlights of being at our property and why we try and have everything you might need to enjoy yourselves. It always nice to explore the area by car and the villages and towns north of Uvanå in Dalarna are always worth a visit. Vansbro and Malung and Mora and Rättvik on the Siljan lake. There is a bear park at Orsa and a water park at Salen. We have introduced a large mosquito netted gazebo for the garden this year which is perfect for sitting out in the garden to enjoy your evening meal! We spent two weeks in this Swedish Holiday House last July with three teenagers and even though the weather was not always sunny, we had a brilliant time. The house was really cozy upstairs and the lack of internet and TV channels made this a fabulous family holiday. We played games, went canoeing on the lake, went on Elk Safari, explored the surroundings of Uvåna, used the Sauna every Night, enjoyed the garden playing badminton and Boules. Best Family holiday we ever had. The area is remote and beautiful. So much forest. We did an Elk Safari with PJ Erlebnistours in Ekshärad and learned a lot about Värmlands Wildlife. We also went on the Dressin Trolleys which was great fun as well. Loved everything about this holiday! We are so happy that you had a wonderful family holiday in Uvanå. We have to agree that it is the most idyllic, get away from it all haven! Certainly if you enjoy nature, wildlife and outdoor adventures in summer or winter you'll enjoy this beautiful part of Sweden. We do agree it is cosy upstairs with the lounge with open fire and great views of the forest and lake.We have also had a wonderful wood burning stove installed in to the main lounge downstairs which adds a welcoming cosiness to the house in spring, autumn and winter. More additions are planned for the coming few years! There are many wildlife adventures, canoe tours and skiing destinations around the area and the Swedish Rally passes the house in February. Traditional Swedish wooden country cottages on lake bordering the Dalarna region, with sauna and canoes. Perfect for outdoor summer activities, canoeing, cycling, hiking, fishing, berry-picking & wildlife-spotting. Build a raft and float down the Klarläven river. For a winter break try the many sports and activities like downhill skiing at Salen just a short drive away. Our cottages lie on the shores of lake Nain. The main house offers spacious accommodation for 6 people with 3 large bedrooms, additional sofa beds, open plan lounge and dining area, downstairs bathroom with shower, full equipped kitchen and TV/DVD. Upstairs you will also find a quiet lounge with open fireplace and lake views. The 2 smaller cottages in the garden sleep a further 4 people. Daytime tour the lakes and historical villages of the region or take canoes for an island adventure, beach picnic or fishing trip. In the evening enjoy an alfresco meal or play outdoor games in the garden overlooking the lake. Golf: Several courses within 100km radius. Closest in Malung (50km) follows course of Vasterdalälven river. Ski: Major resorts Sälen (80km) and Branäs (100Km) and small ski resort at Säfsen (60km) with variety of family activities and facilities. Guaranteed skiing Xmas until Easter [20th December to 20th April approx.]. Many local slopes in 40 Km radius at Äppelbo, Ekshärad and Malung including equipment hire and open for most of winter.You can also try out Husky dog sledding through the alpine forests,hire a skidoo or go ice karting at Klappen. Plenty of cross country routes and tracks even straight from the house and across the lake. You can also find ice skating tracks across many of the lake,Lake Siljan near Orsa and the Berglagskanal from Filipstad to Kristinehamn. Also ice skating on Lake Runn.There are local contacts offering lessons in cross country skiing and snoe shoe hiking and ice fishing. We have a small selection of cross country skis and snowboards for rent if you wish.